July | 2011 | 50 Westerns From The 50s. 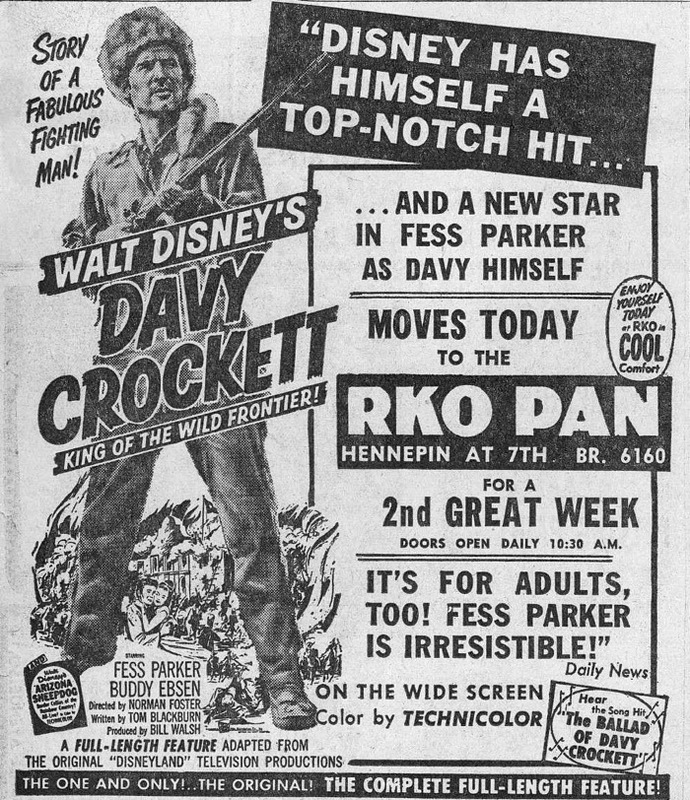 Davy Crockett, King Of The W I D E Frontier. But what does “Wide Screen” really mean? Shot for television (Walt was sure smart to shoot in color), they were full frame 1.37:1. But how did it play theaters? Disney didn’t include projection instructions in their pressbooks, so it’s hard to say. Playing around with the DVD, a 1.66 or 1.78 cropping looks great. 1.85 seems a little crowded. Maybe “Wide Screen” was just marketing, and it ran full frame. Can anybody out there shed any light on this? If so, Fess up (sorry, couldn’t resist). UPDATE: John McElwee at Greenbriar Picture Shows says Variety listed it as 1.85 in its review. In case you ever wondered what Gene Autry’s letterhead looked like. What a beautiful illustration, complete with camera crew. 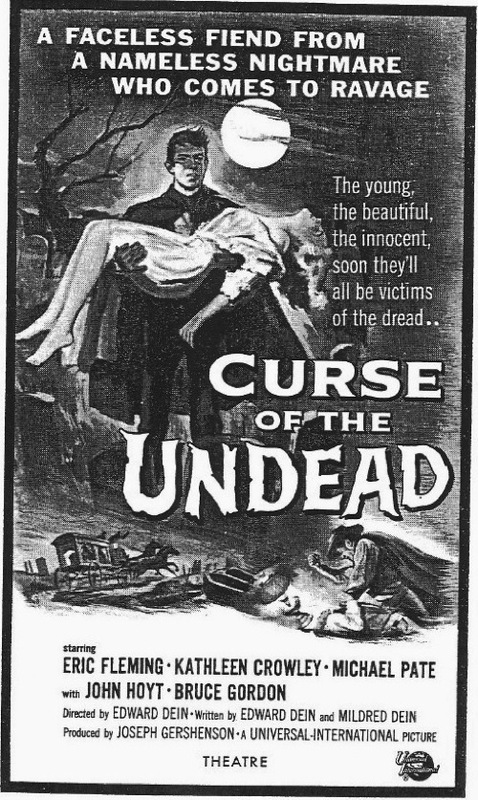 Curse Of The Undead (1959) is a picture I’ve written about before — a cheap, but clever mixing of the Western and the monster movie, two things Universal-International did better than about anybody else in the 50s. It’s certainly no classic, but it’s got plenty going for it. As a kid, I thought it was one of the coolest things I’d ever seen — and Reynold Brown’s poster art is incredible. As part of the 50s Monster Mash Blogathon, owned and operated by Nathaniel at Forgotten Classics Of Yesteryear, I’ll revisit this picture — by simply posting the chapter-in-progress on it. (Not sure the chapter will actually make the book’s final cut.) Nathaniel recently organized the Roger Corman Blogathon, which I was stoked to be able to participate in. This is not a new release, just one I didn’t know about — so it might as well be a new release. Last week, I wrote about the terrific B Westerns Wild Bill Elliott made for Monogram and Allied Artists in the early 50s. 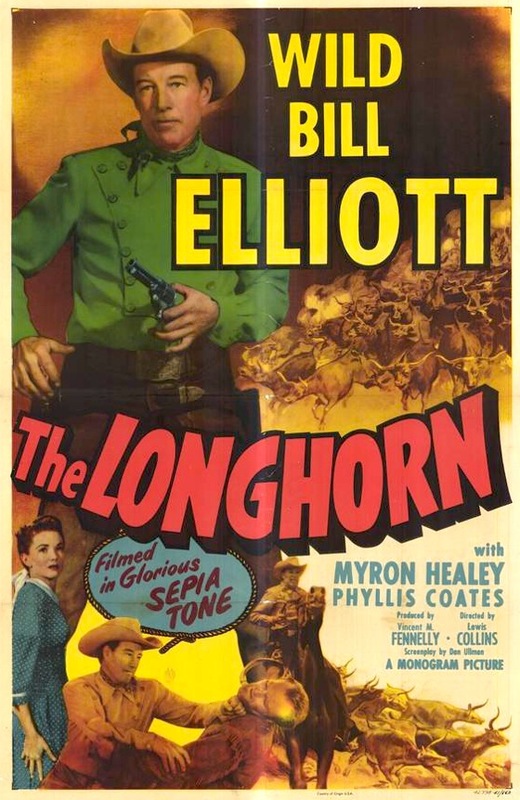 Well, I just found out that one of them, The Longhorn (1952), is available from VCI Entertainment. It’s paired with Stampede (1936), Charles Starrett’s first Western — in a set called Cowboy Heroes Volume 1. Not sure if it’s presented in sepia tone or not, but after I get a copy, I’ll let you know. Warner Archive has announced a handful of Clark Gable pictures as their newest DVD-R releases. Two of them are Westerns. 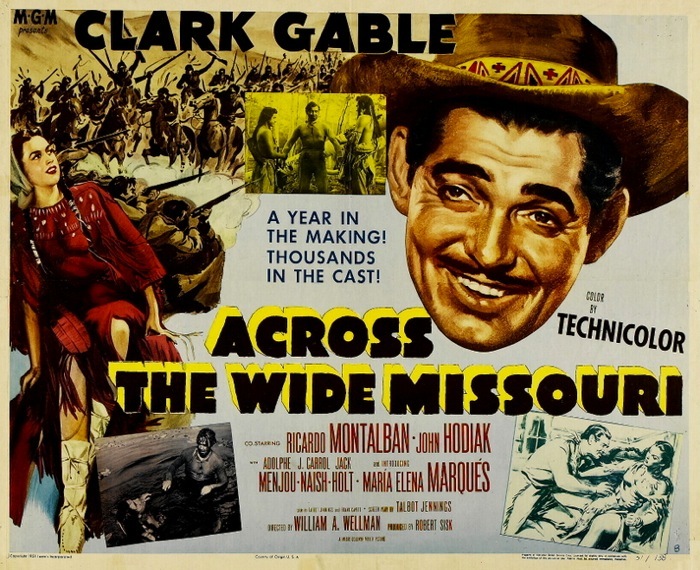 Across The Wide Missouri (1951) is an excellent film from William Wellman. The story goes that after a preview, MGM got a little scissor-happy with it, leaving us with a fast, tough, beautiful 78 minutes. Joining Gable in the top-notch cast are Ricardo Montalban, J. Carrol Naish, Jack Holt and Timothy Carey (uncredited in one of his first films). Also on its way is Lone Star (1952) which puts Gable up against Broderick Crawford, with Ava Gardner in the female lead. Directed by Vincent Sherman, it’s not one of Borden Chase’s better scripts. The Bel-Air pictures continue from MGM’s DVD-R program. 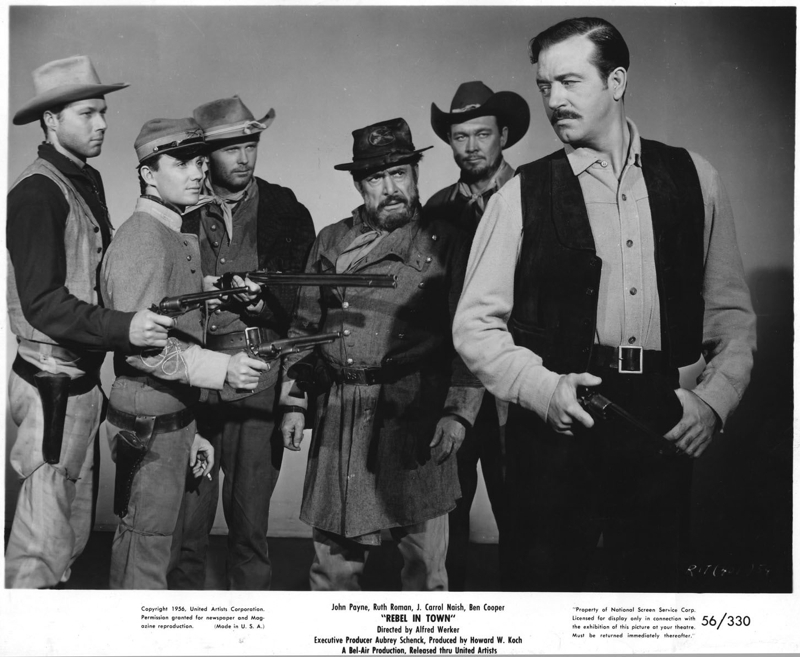 Rebel In Town (1956) has a great cast — John Payne, Ruth Roman, J. Carrol Naish, Ben Cooper and Ben Johnson. It was directed by Alfred Werker. This is one I’m really looking forward to. The Broken Star (1956), directed by Lesley Selander, stars Howard Duff and Lita Baron. It was available on Hulu for a while, in a nice-looking, though full-frame transfer. Outlaw’s Son (1957), another one from Lesley Selander, stars Dane Clark, Ben Cooper and Lori Nelson. The Iron Sheriff (1957) is a Grand Production, not a Bel-Air, with Sterling Hayden, John Dehner and Constance Ford — directed by Sidney Salkow. Hopefully, these will be widescreen. By 1956-57, 1.85 was pretty much the standard, and these pictures really benefit from that cropping. 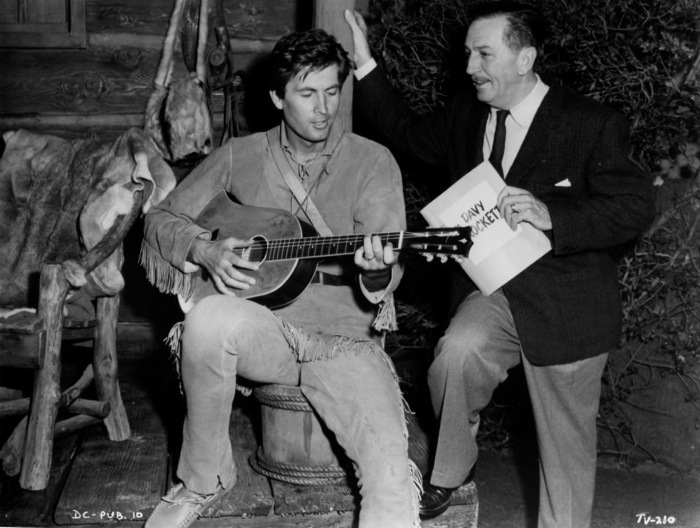 Not long after I started working on 50 Westerns From The ’50s, the book, I became really interested in the Regalscope pictures Robert Lippert made for 20th Century-Fox. The process was the subject of one of my earliest posts. 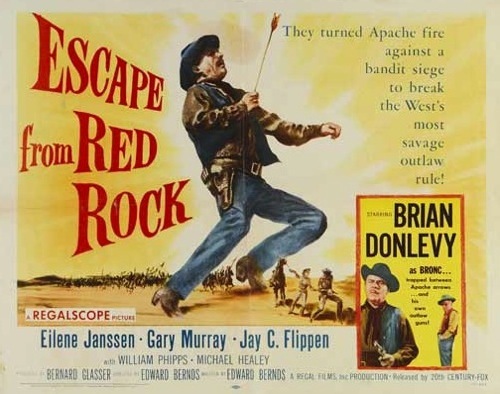 These short (normally around 70 – 75 minutes) Westerns are usually pretty talky — talk’s a lot cheaper than action — and they seem to have spent $12 and five minutes to prop out the sets, but they feature some great casts: John Agar, Forrest Tucker, Brian Donlevy, Charles Bronson, Jim Davis, Beverly Garland, Mara Corday, Kathleen Crowley, Mari Blanchard, Hank Worden, James Griffith, Lee Van Cleef, Robert Strauss, Barton MacLane and Morris Ankrum. 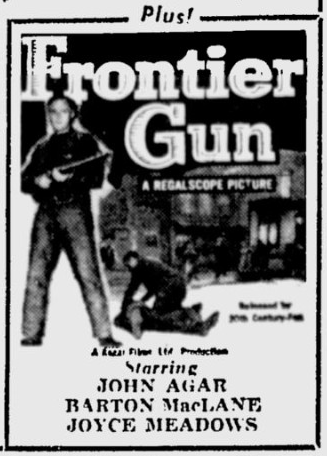 Lately, I’ve contracted the Regalscope bug all over again — partly due to seeing a letterboxed copy of Frontier Gun (1958). Not a bad little movie. Kit Parker has dedicated a lot of his recent blog posts to organizing a Lippert filmography, including the Regal Films productions. He’s also chatted with Robert L. Lippert, Jr. and Maury Dexter, who actually worked on these things, and a few film historians — there’s a real mystery to sort out with these things. Kit’s posts are fascinating, though they ultimately add to the frustration of these films being so hard to see.